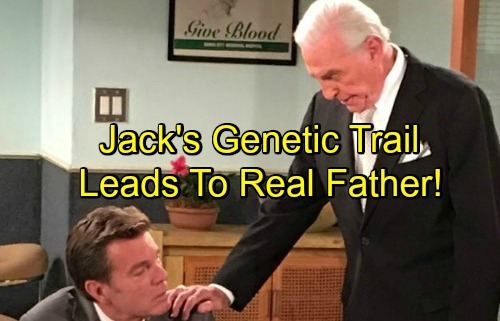 The Young and the Restless spoilers tease that leading information Neil (Kristoff St. John) provides to Jack (Peter Bergman) will send the former Mr. Abbott on a summer search. Whether Y&R’s writers are taking viewers on a goose chase is yet to be determined, but hardly an offense if proven true. The idea that Jack Abbott isn’t an Abbott is outrageous! Yes, claiming that John (Jerry Douglas) isn’t Jack’s dad is as preposterous as saying that Adam (as last played by Justin Hartley and as previously played by Michael Muhney) isn’t alive. But daytime drama is like that as all seasoned devotees knowingly accept. Executive producer and head writer Mal Young has directed his writing staff to enter dangerous territory. If, in fact, Jack proves to be some other man’s biological son a contingent of fans are going to be torqued. Emotional boycotts have become somewhat trendy in the western world, as easily swayed followers reject the principles of democracy. Rational adults don’t boycott businesses they don’t like and encourage others to do the same. Immature, at best, personality types do that. Historically, that irrational behavior has rightly been classified as mob rule. So if a fictional character on a daytime soap opera turns out to have a different father than has always been known it would be irrational to encourage people to stop watching the show. Question it, sure. Pound a smartphone screen to try and incite total strangers to stop watching forever, with a capital F. No. Following the above path would threaten the jobs of hundreds of people. And how, exactly, will any viewer’s life be damaged by Jackie-boy not being an Abbott? Right, their lives wouldn’t have changed a bit. Now, let’s assume that Mal Young is taking Jack on an odyssey that leads to him learning that John was his dad, as he always believed. Dina’s (Marla Adams) Alzheimer’s condition created understandable doubt. Jack’s DNA samples didn’t match Traci’s (Beth Maitland), or Billy’s (Jason Thompson) because they aren’t Abbott’s. Later this year, Jack reverts to Abbott status. Also not a cause to riot, but surely a more logical Y&R endgame. All forms of so-called advancing technology have varying degrees of upside, neutrality, and downside. Access to the internet has given the masses the ability to anonymously and falsely defame people (like Muhney) and to encourage people to take negative actions, like boycotting Y&R simply because a storyline is disliked. Both willful actions and others are reflective of personality types who believe that no consequences will result for whatever attacks are made. But is that always true? No one can ever make that claim. Jack has come to believe that what he knew about his father was a lie. Those who assault entertainers and TV shows act as though actors aren’t real people with professions and that soaps aren’t actual businesses. Those are lies too. Yes, people who choose to be cynical use their free will to think themselves down a rabbit hole. Doing so is narcissistic and self-destructive. Honest soap fans who try their best to live balanced lives have empathy for Jack and will follow his storyline this summer without overreacting. That’s what mature minds do in a civil, soapy society.